You are here: Home / Fitness / Add recovery to your routine. Add recovery to your routine. Do you foam roll? A lot of us tend to skip warm ups and cool downs, but research is stronger than ever promoting the addition of “recovery” into our fitness routines. The most common is to roll the length of a chosen muscle for a set time (1–2 minutes is the most common). Another common technique is to “knead” the muscle with small back-and-forth motions along the length of the muscle. A frequently used method—used with foam-rolling devices that aren’t actually rollers (e.g., Thera-cane)—is to hold pressure on a tender spot. All of these techniques appear to work well at either improving range of motion or decreasing pain. Trauma, irritation, repetitive use and a sedentary lifestyle create stiffness and can shorten the muscles and/or fascia. A few minutes of foam rolling offers many benefits. Try this simple foam roller warm-up to allow your limbs to move more freely. When calf muscles are overworked, they become short and tight, limiting movement. Sit on floor, calf on top of foam roller. Cross opposite leg on top (if tolerated). Internally and externally rotate leg with continued compression, knees bent, 4×. When quadriceps muscles are overactive and shortened, many people experience knee problems and alterations in body alignment. Start in prone position (laying on your stomach), foam roller above knee, elbows beneath shoulders. Bend opposite leg up toward hip. Roll one-third of the way up (closer to knee), 4×. Roll next one-third section (midthigh), 4×. Roll below hip flexor, 4×. 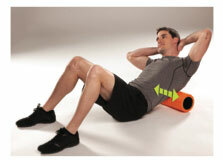 Lie supine (laying on your back) with foam roller above low back. Place feet flat on floor. Rub from side to side, 4×. Roll to upper back, 4×. When posture is poor, chest muscles shorten and the shoulders round forward; this affects breathing and may cause neck and shoulder pain. 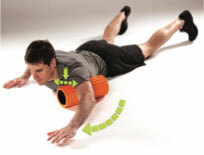 Start in prone position, foam roller placed diagonally across chest (just inside armpit). Place hands in push-up position. Roll forward and backward 1 inch, 4×. Reach working arm out in line with shoulder and sweep up toward head, 4×. Want to learn more about foam rolling? http://newtownathletic.com/wp-content/uploads/2014/04/NAC-logo-png-300x136.png 0 0 Taylor http://newtownathletic.com/wp-content/uploads/2014/04/NAC-logo-png-300x136.png Taylor2018-02-19 21:29:322018-03-28 16:54:05Add recovery to your routine.